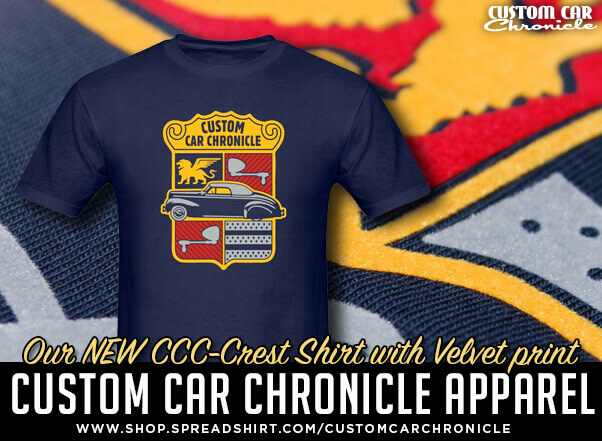 Paul Bragg aka TinGuy from Paso Robles California creates a stunning 1953 Oldsmobile 88 for customer Ralph Bagdasarian from Fresno California. 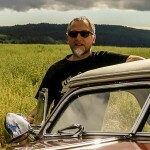 Metal master and Custom Car designer Paul Bragg has created many subtle and not so subtle Custom Cars and Hot Rods in the last couple of decades. Some of these were complete finished cars, others where projects he did a certain amount of work on, usually chopped tops, or other specific Custom Body Work.His work is always stunning, both in execution, as well as in style and balance, with respect for the history, but often with a twist of his own imagination. 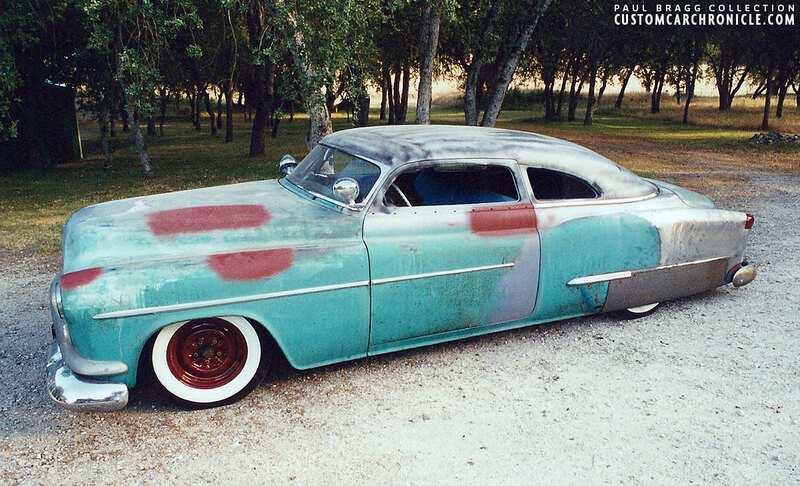 A good number of years ago Paul was asked to do his magic on a 1953 Oldsmobile 88 two door sedan for a client Ralph Bagdasarian from Fresno. A really beautiful car to start with, but yet rarely seen as full Custom. The plan was a full custom as if it could have been done back in the mid 1950’s. Chopped top, custom head and taillights, smoothed body etc. Together with Ralph, Paul made a plan and some sketches for the car. 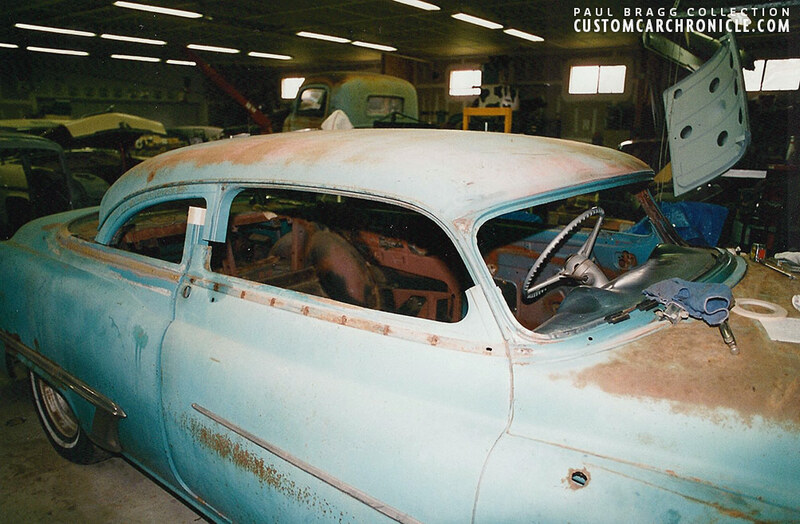 The top needed to come down a few inches, and the large rear window would become a much smaller size rear window from a ’49 Chrysler 4-door. 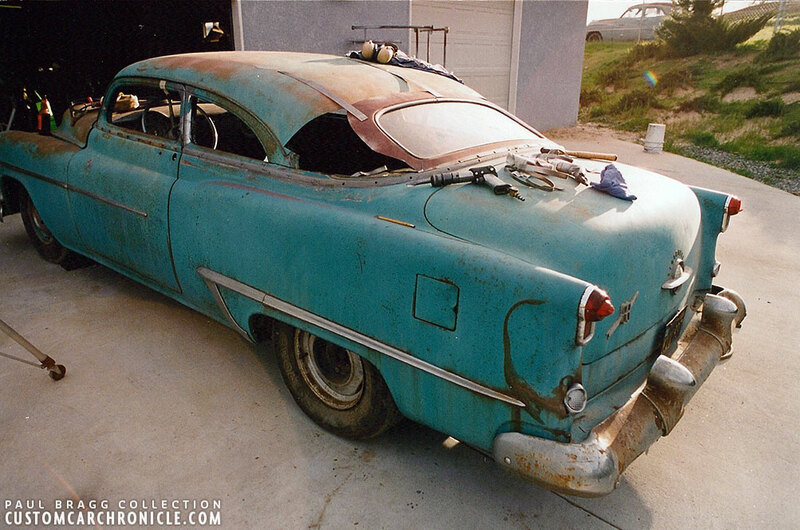 The rear fenders would be extended and a set of ’54 Packard taillights installed. The front fenders would receive frenched headlight on slightly extended fenders. 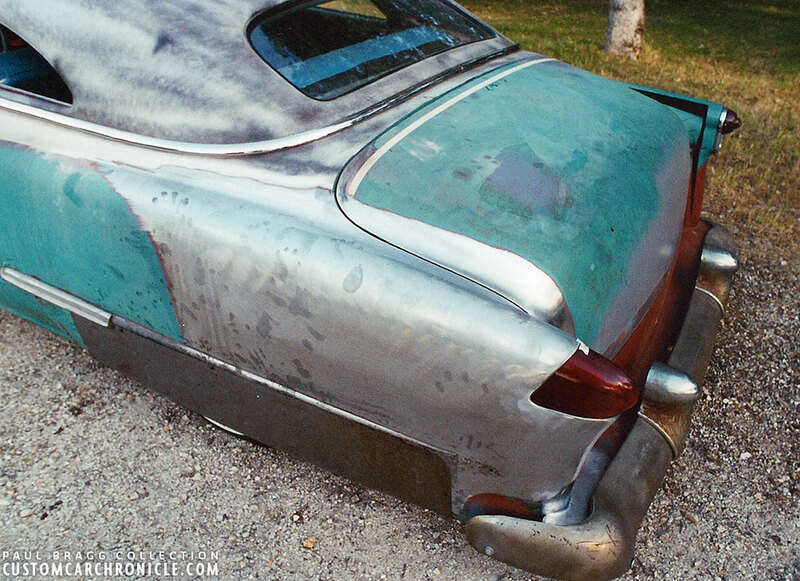 to stay in balance with the rear fenders. 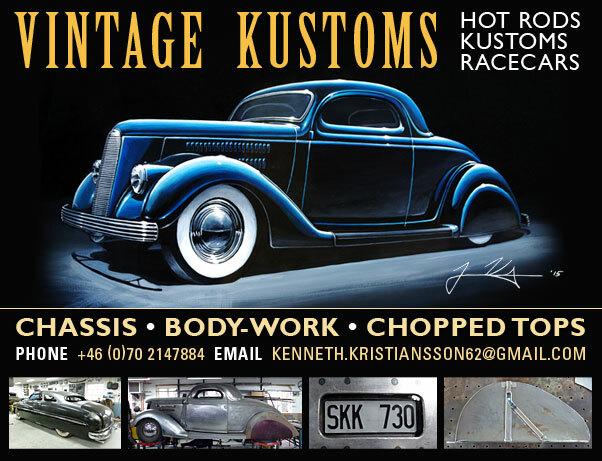 Rounded corners, shaved handles and emblems, angled B-pillars and scratch built long fender skirts were all part of the plan to create one super smooth uniquely restyled Custom Car. 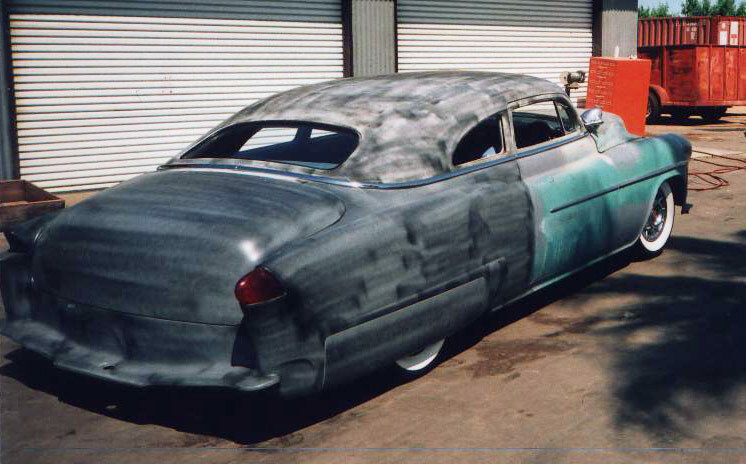 Paul did the majority of the work on the car over a period of time and the body worked sections were sprayed with primer and guide coats to make sure they would be smooth enough for the final primer. 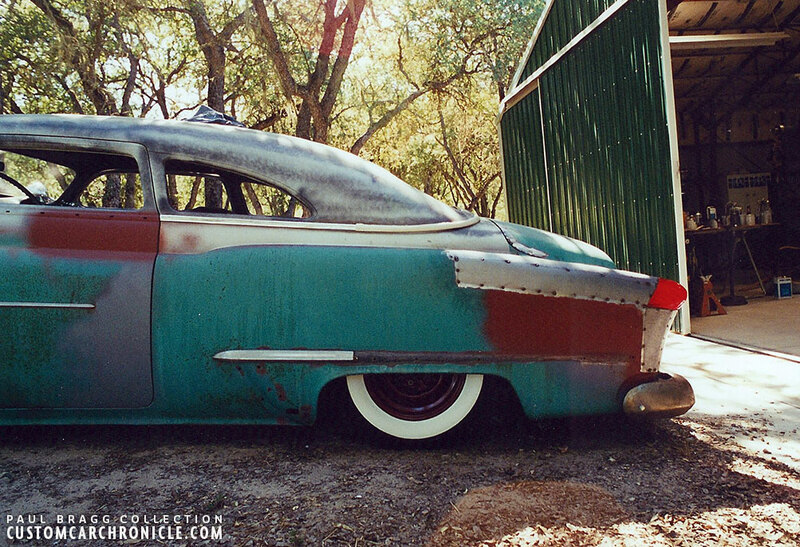 The car was delivered like this to Ralph in Fresno many years ago, and is still patiently waiting among many other project to get finished. Hope, fully one day we will see this Paul Bragg master piece all finished and painted on the roads of sunny California. 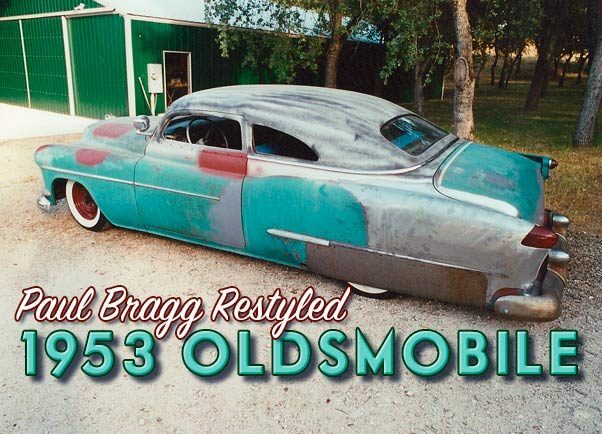 Lets take a look at some of the photos Paul Bragg took along the way of restyling Ralph Bagdasarian’s 1953 Oldsmobile Custom. Early stages of the chopped top. All the glass was removed and the A pillars had been cut the right amount to drop the top to the perfect height. The C-pillars were cut slightly more for a nice flow of the roof. The door tops had been cut off and removed for this step. And since the B-Pillars were going to be angled forward they were just roughly cut at this stage. 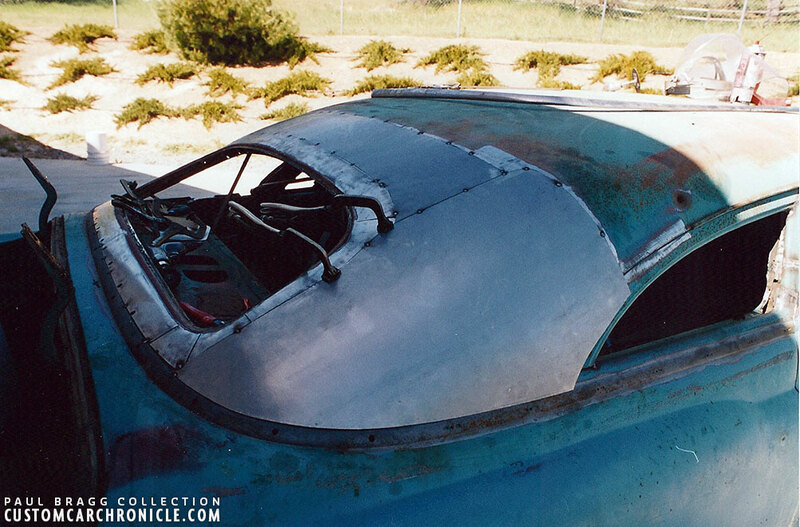 Paul and Ralph did not care for the large rear window, so a smaller unit from a ’49 Chrysler 4-door donor car was cut and set in place to flow with the forward slid roof. 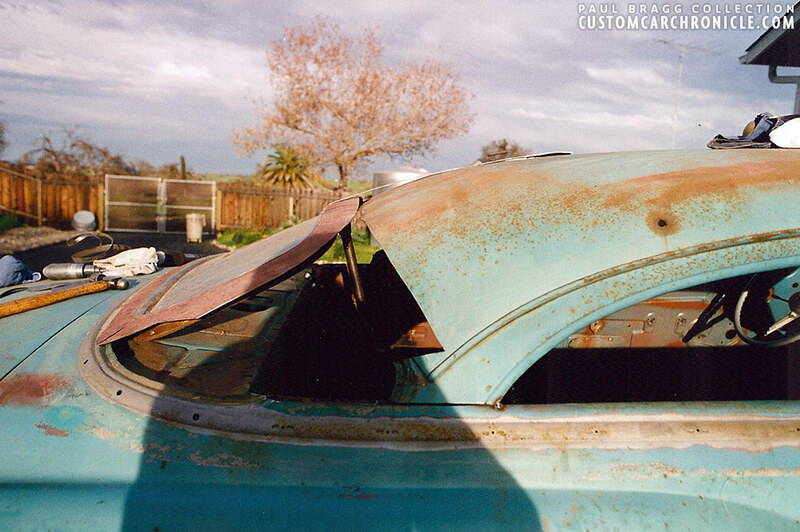 This photo shows that the rear portion of the roof angles down to much and will need to have some work done to flow with the new rear window which is set in on a steeper angle. 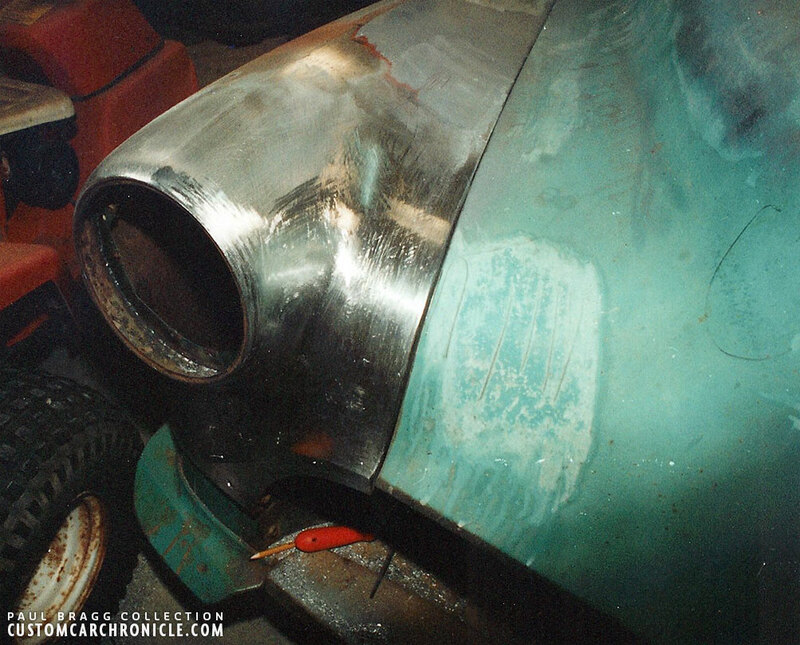 The C-pillar has been tacked in place at this stage. Paul used small straps of thin sheet meal to see how much of the roof needs to be replaced with hand shaped metal to get the right shape. Notice that during this stage the rear glass is still in place. This helps get the flow of the new top just right. 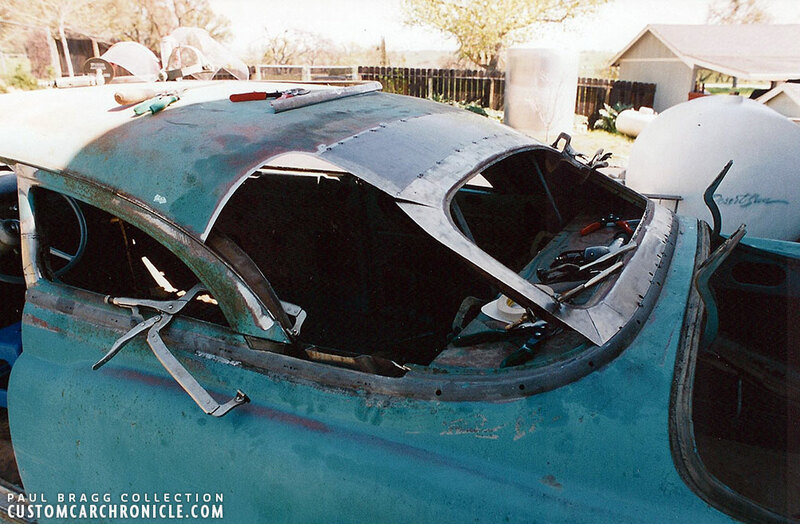 The glass is now removed, the old paint stripped and more sections of the Oldsmobile roof, that did not flow right, are cut off and removed. 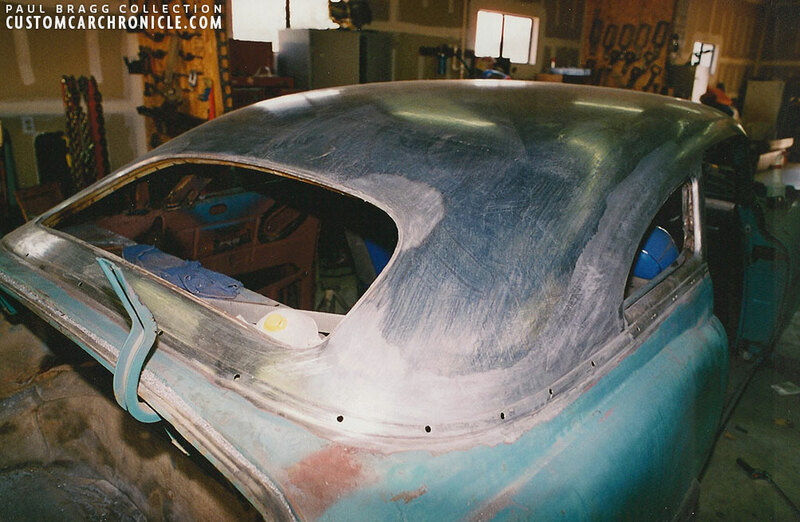 Paul has just started to fill in the gaps with freshly shaped sheet metal between the roof and the ’49 Chrysler 4-door rear window surrounding metal. Notice that the new rear window is in the same location as the old rear window and the rear of the roof line has not been moved forward. This creates extra optical length and flow to the roof. Starting on the passenger side, Paul shapes the new sail panels on his English Wheel. Using paper templates and a lot of patience he gets the panels to fit almost perfect, only needing very little work, and small amounts of lead to blend in with the cars roof and donor rear window. The completed rear portion of the roof, all metal finished and the edged feathered in with a small amount of shaped lead. After the top was cut down several inches it automatically moves forward. To overcome this, you can either lengthened the door post so that the top portion of the B-pillar lines up with the door line again, or you can, as Paul and Ralph decided to do on this Olds, angle the B-post forward. To make it look even better it was decided to round the door tops and later to remove the drip rail. 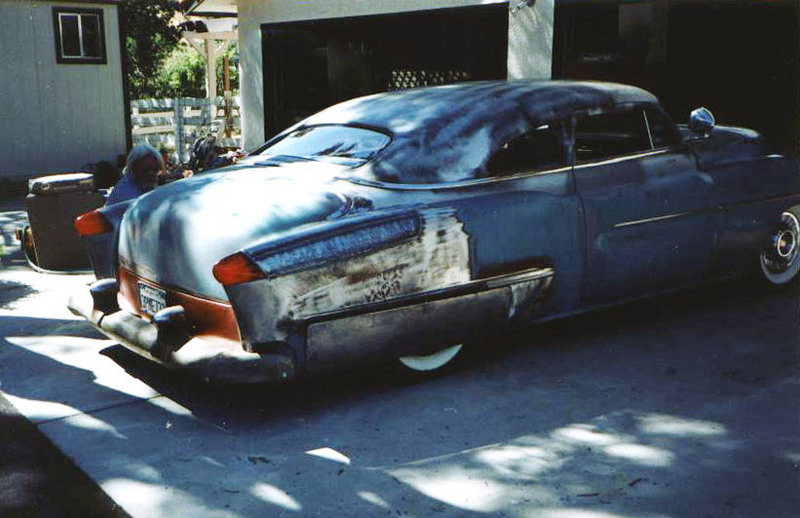 Later Paul started to further restyle the car with the addition of ’54 Packard taillights, which required the rear fenders to be extended and the top of the fenders to be reshaped. 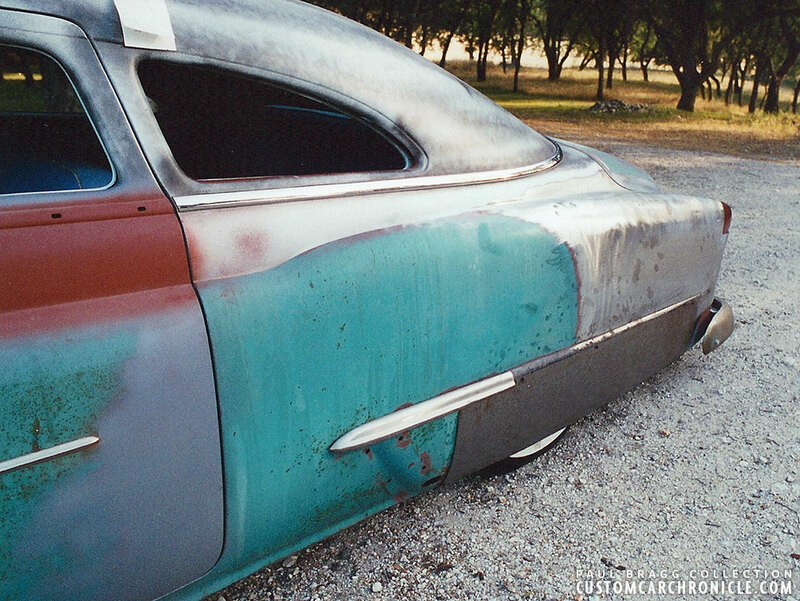 The tops of quarter panels were lowered towards the rear, along with deck lid aprox. 3 inches, to create a better flow. 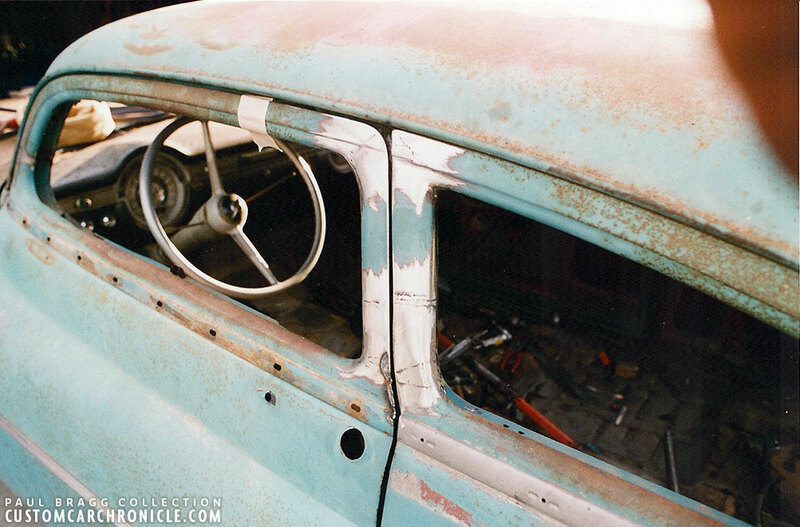 Paul also filled in the holes left from the door handles and gas cap at this point. The roof is now in primer with a guide coat to check for any imperfections. The car is now also mounted on a set of wide white wall tires that hep with the overall vision of the car during this process. 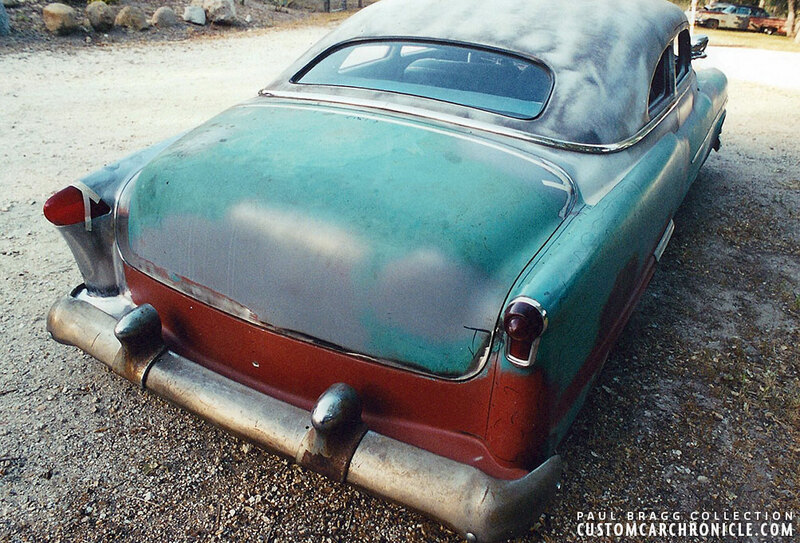 This photo shows the restyled drivers side rear fender with the Packard light installed and the stock Olds rear fender on the passenger side. It also shows why the rear fenders had to be extended to be able to use these taillights. The point at the front of the taillight needs to clear the trunk. The splash pan was molded in, and the holes left from the trunk trim and handle have been filled. Drivers side rear fenders all metal worked and ready for primer. The angled forward B-pillar, rounded corners and shaved drip rail makes the top look very smooth. Notice how the shape of the rear quarter window is flowing with the shape of the top. New hand made long fender skirts are test fitted. Stepping back from the car we can really take a good look at the new wonderful flow of the chopped top, shaved drip rail and smaller rear window. 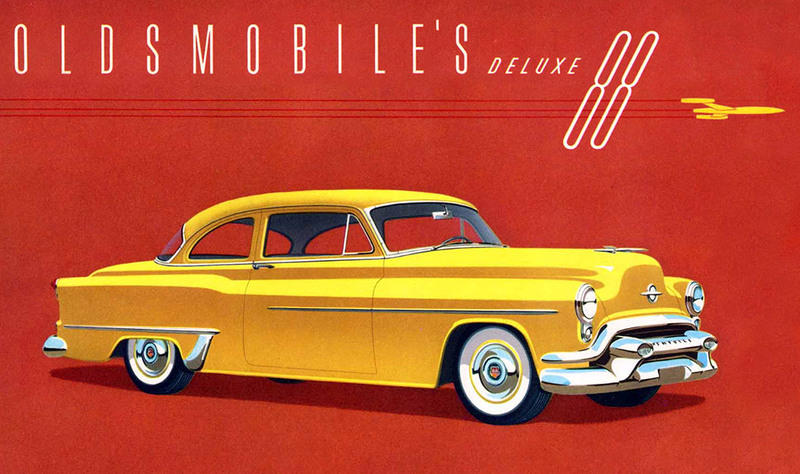 The angles and shape of the Packard taillights work beautiful on the Oldsmobile. Paul also installed a set of Appleton Spotlights. Beautiful lines, perfect stance. 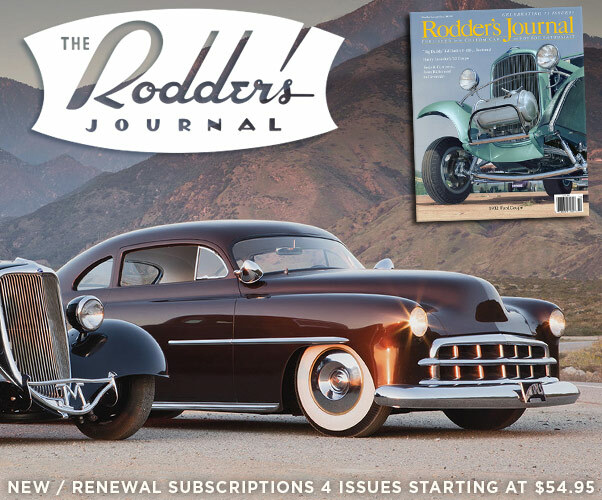 Front fenders are extended with molded in Mercury headlight rings. With all the fresh restyling in a coat of primer and guide coat. This is how the car was deliverd to the client, and this is the last update we have seen of the Oldsmoible. The car has very nice proportions, beautiful lines and I really hope the car will be finished in the near future. Rear quarter view shows the beautiful shape of the chopped top and the donor rear window. The only comment I would make in regards to the amazing bodywork would be about the fabricated panels below the taillights. If they were curved inward, like the factory stock ones, they would have more eye appeal. Just one old “Custom” guys opinion! Been following Paul’s work for many years. He has a great eye for “the look” and the craftsmanship to fabricate his creations with the best of them. 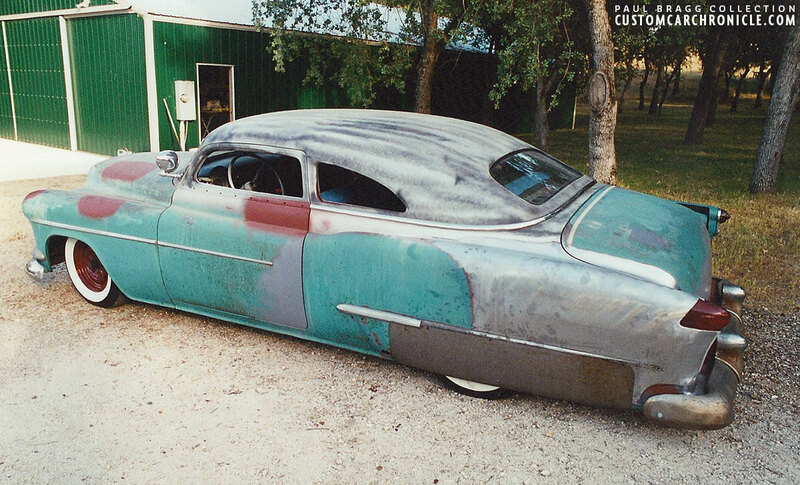 Thanks Rik for showing us this unusual Olds custom…Hope it gets finished some day. I have always been impressed with the “quality body work” and the “look” of the cars that Paul Bragg builds. 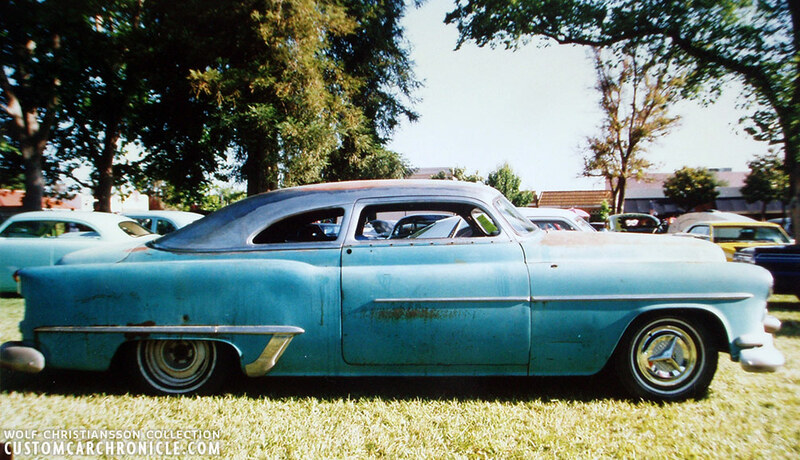 I really like the profile of this ’53 Olds after he chopped it and restyled the front and rear fenders. 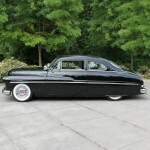 hi rik great article i might add, tops of quarter panels were lowered along with deck lid aprox. 3 inches. they curve front to back instead of straight line front to back. sneaky but effective!!! thanks again!!! Very nice work and I love the proportions of everything Paul restyled including the roof. Another great car from Paul! I love his work. I am always hopeful there will be some updates on the customs he has been building lately. I’ve always loved this car from the 1st time I saw it at Paso. I talked to Ralph a few times over the past several years and always encourage him to finish the car. Another great Paul Bragg custom.